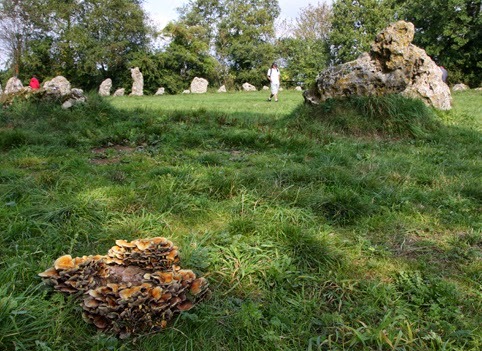 Nevertheless, Sunday 21 September felt like a perfect day to be celebrating the season turning autumnal and I was at the Rollright Stones where the Cotswold Order of Druids put on a spectacular open ritual. The weather was warm and the sun was shining, but the leaves on the trees were starting to take on shades of gold and mushrooms were thriving in the fields and woodlands. I photographed that lovely ring of toadstools on a rotten tree stump by the stone circle earlier in the afternoon before the crowds turned up for the ritual. It is the first time I have been to the Rollright Stones, but I fell in love with them immediately. They seem different from most other stone circles I have visited - possibly unique. It is the shapes and textures of the stones that makes them seem so full of individual character - in places they are jagged and in other places worn, they are pitted and lichen encrusted, and many have holes right through them. I'll be writing more about the history and details of the stones at a later date, but I will say the circle is a great size for a modern pagan ritual. The Autumn Equinox rite that I took part in on Sunday was longer and more elaborate than many other pagan open events I've been too. After everyone had entered the circle and the quarters had been welcomed there was a talk about the meaning of the equionox, a play enacting the story of Persephone, storytelling about the legend of the Rollright Stones, drumming, poems, walking a labyrinth and plenty of yummy cake passed around with a chalice of wine. The Cotswold Order of Druids puts on public rituals at the Rollrights celebrating all the seasonal festivals - the next being at Samhain. The Rollright Stones are near Chipping Norton, in Oxfordshire, and you can visit them any day. Entry is £1 and there is an honesty box when no warden is present at the site.